There are so many factors that athletes must weigh when making decisions regarding what’s best for their careers. Like any career decision, they must think about what’s best for their families, health, money, etc. But unlike most 9-to-5 jobs, their window of career earning power is much smaller. This is what makes questioning their decisions a sticky situation. Ultimately, everyone – pundits and fans alike – must remember that when it comes to an individual’s career, they must be allowed to do what’s best for them. This brings us to Askia Booker. Earlier this week, Booker made the decision to tap out of the College Basketball Invitational tournament. The Colorado senior has yet to give the exact rationale for his decision, but common sense tells us that he doesn’t think the CBI is worth his time. Booker battled hip soreness down the stretch this season and looks to be using his last few months in Boulder to rest for his next step in basketball – most likely a professional career overseas. This decision has generated opinions on both sides of the spectrum. Both sides need to cool it with the hyperbole. Booker did what he felt was right for him, but was it the right decision? Before diving into his decision, there are a couple of things we must put on the table. First, the CBI is total joke; there’s no doubt about it. It’s a third-tier pay-to-play postseason tournament that means nothing. Colorado is the only school from a major conference that accepted a bid; they’re also the only school with a losing record in the tournament. Why they were invited and why they accepted that invite is a mystery. Second, Booker doesn’t owe the university or Tad Boyle anything more. Boyle and the university have made millions off of Booker and his contributions in helping to rebuild a dormant basketball program. Playing in the CBI doesn’t change the fact that he deserves major credit for putting CU basketball on the map. With all of that, Booker should still have been in uniform last night; he owes it to his teammates. Team sports are a brotherhood. Players remind us all the time that their top priority is battling nightly for the guy next to them. Booker’s willingness to push that aside is his biggest sin. Alec Burks was in a very similar situation in 2011 when the Buffs were left out of the NCAA tournament. Boyle’s disappointed squad was NIT bound, a tournament that Burks could easily have decided wasn’t in his best interest. Rather than bailing on his team, however, Burks was arguably the best player in the tournament. Now, you can argue that NIT is a much better tournament than the CBI; that definitely wouldn’t be wrong. But also remember that Burks had way more on the line. As a projected lottery pick (eventually taken 12th overall by the Utah Jazz), it would have been very reasonable for Burks to sit out for fear of injury. The money Booker stands to make pales in comparison to the guaranteed money Burks could have lost out on had something catastrophic happened. If Booker’s decision is rooted in the idea of letting younger players such as Dom Collier get more playing time, as some have suggested, that’s understandable and quite commendable. But why can’t he sit on the bench in uniform to cheer those guys on, provide advice and help them prepare in practice? That’s what those players have done for him all year. Being a mentor and a leader shouldn’t be dependent on whether or not one feels like a game is pointless or not. If this is the type of leadership Booker provided all year, it speaks volumes about CU’s extremely disappointing season. Booker was noticeably absent last night for the Buffs CBI opener at the Coors Event Center. That’s extremely disappointing and an extremely selfish decision. Not only did he choose to tap out before the season was over, but he couldn’t even be bothered to cheer on teammates that have stood by him all season long. Booker unquestionably let down every player on the bench last night. At the very least, he owed his teammates the respect to show up and support them, just as they’ve supported him throughout a tough season. Booker is guilty of the ultimate sin in team sports, thinking he was bigger than the team. 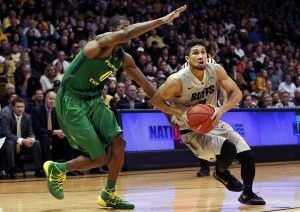 Unfortunately, his selfishness will define his career at CU. Booker didn’t owe it to the university to play or even show up. He didn’t owe it to Boyle and he didn’t owe it to the fans (1,500 of them that showed up last night). Askia Booker owed it to the guys in the locker room to be there with them until the end. That’s what he forgot to weigh when making his decision. Booker’s decision revealed that his leadership and sense of team are as meaningless as the tournament he’s skipping.